I really hate the expression “self care,” but I have been developing strategies for keeping my news feed from overwhelming me with anxiety, despair and anger. At the risk of appearing anodyne, I will share my five-point plan. 1. Practice harm reduction with intake of news. Try to keep social media to specific times of the day and limit the length of exposure. I will admit that I’m struggling with this one, but making some headway. 2. Keep devices out of the bedroom. Read a book before going to sleep—preferably something unrelated to current events. Right now I’m reading The Bedside Book of Birds and Barbara Ransby’s biography of Ella Baker. 3. Find time each day—even fifteen minutes—for something you enjoy. I love to bake, to doodle, to knit, to listen to music, to study Armenian, to walk in Central Park, or to watch an old film. Do something creative. Go to a museum. To this end, look at this beautiful slideshow of photos by Gordon Parks. 4. Spend time with people you like or love. Go out for a meal with friends or family. Have friends over to watch a movie. Call someone you haven’t talk to in a long time. Start a reading group (also read about the radical history of reading groups). 5. Practice daily resistance. Send a post card, make a phone call, or go to a meeting or a protest. Organize. Resist. Even five minutes a day can help ward off despair. Massachusetts Senator Elizabeth Warren is this week’s hero of the resistance. She attempted to read Coretta Scott King’s 1986 letter opposing Jeff Sessions’ appointment as a judge on the Senate Floor. Senator Majority Leader Mitch McConnell used an arcane rule to vote her into silence, saying, “She was warned. She was given an explanation. Nevertheless, she persisted.” She was banned from speaking during the rest of the debate so she left the chamber and continued reading the letter, streaming it over Facebook live. 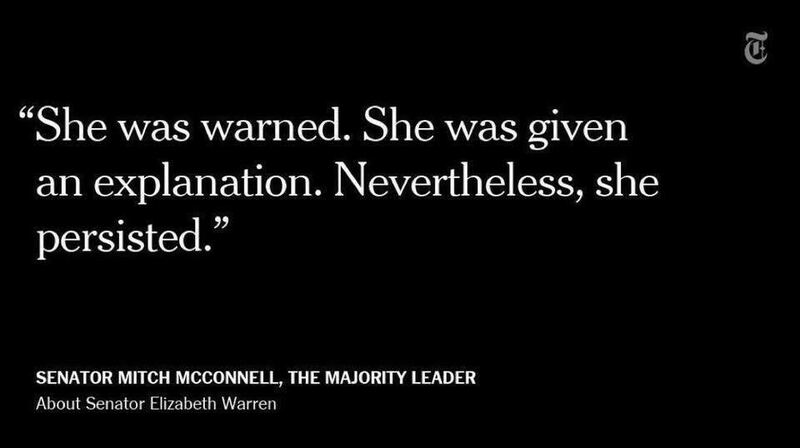 And thus was an Internet meme (and a call to resistance) born: “She persisted.” May we all persist and resist. The Nation has provided a guide to groups organizing resistance to the Horsemen of the Apocalypse. This is primarily focused on electoral organizing and citizen lobbying. The Ides of Trump: send a post card to the White House on March 15. Sign up for the excellent Daily News Roundup from Jewish Voice for Peace. This scary yet essential piece The Data That Turned the World Upside Down is an exposé about the shadowy big data firm Cambridge Analytica, backed by the shadier Mercer family who brought Bannon and Conway to the Trump campaign. The real opportunity for transformational political change (“critical realignment” in a now-archaic vocabulary) belongs to the Sanderistas but only to the extent that they remain rebels against the neoliberal Democratic establishment and support the resistance in the streets. Trump’s election has unleashed a legitimation crisis of the first order and the majority of Americans who opposed him have only two credible political rally points: the Sanders movement and the ex-president and his coterie. While our hopes and energies should be invested in the first, it would be foolish to underestimate the second.